Our little island is known to be a food paradise and so, it's hardly any surprise that Cathay Cineleisure Orchard is filled with a wide range of restaurants! 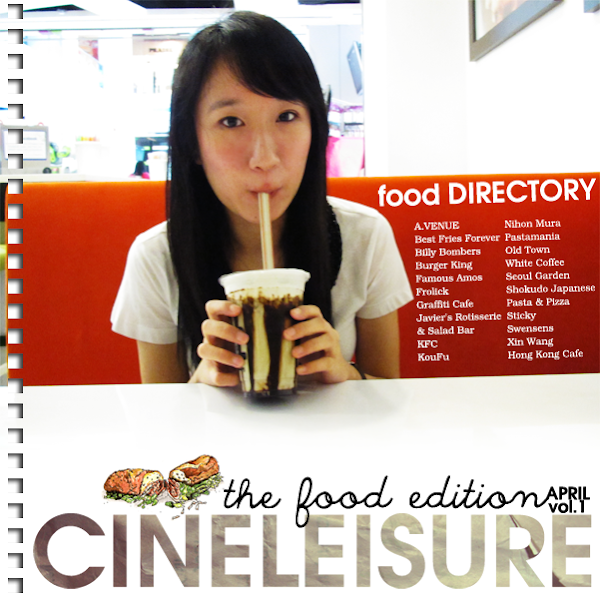 Japanese cuisine, pasta, chicken rice... You name it and Cine has got it! My favourite dish is the Prawn Aglio ($8.90). Prawns, chili, garlic and diced tomatoes are tossed into healthy olive oil quickly to satisfy you craving ASAP. That day, mine was a mixture of spaghetti and fusilli. The prawns were a little powdery to me, not exactly the way I like them to be. But I liked the chili, garlic, tomato and olive oil mixture. The spaghetti and fusilli were nicely cooked, making the dish pretty enjoyable overall. It was only earlier this month that I was introduced to Shokudo Japanese Pizza & Pasta. With walls adorned with bright yellow stripes and the restaurant facing the huge windows of Cineleisure, one can't help but smile! It is such a cheery and bright place and I would love to stay there for hours! 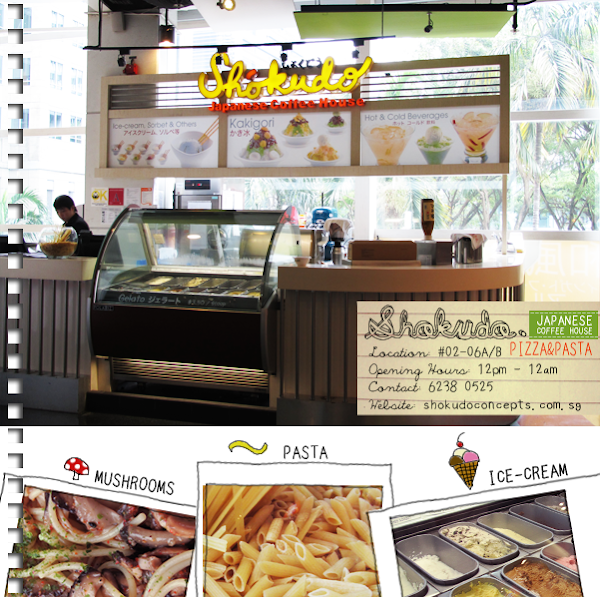 Shokudo Japanese Pizza & Pasta adds a nice twist to the usual Italian dishes. The Japanese spices adds a complexity to the dishes, making the dishes completely different from the Italian counterparts, but they are definitely not any less delicious. 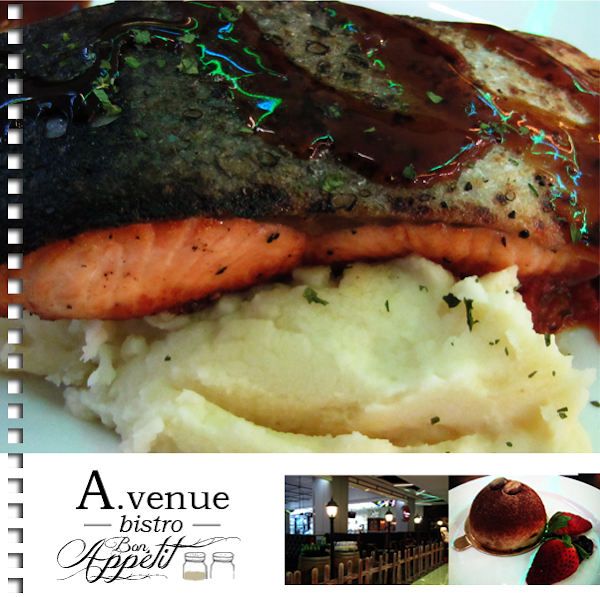 A.venue Bistro is divided into the 2 areas; the kitchen and the dining area. Long, black chairs looking all luscious and rich line the dining area on one side. It looks like the inside of an Old English train. On the other side, a row of London street lamps cast a dim light on the tables, making meals cozy affairs. Fel and I both ordered the Pan Roasted Smoked Salmon Steak with Terriyaki Sauce ($13.90), which came with a dollop of mashed potato and ratatouille. The salmon was nicely cooked, with no lingering fishy smell and the skin was crispy and a complete delight to eat. The mashed potato made a nice companion to the salmon, balancing the rich terriyaki sauce that the fish was topped in. My dinner ended with a dome of tiramisu. The tiramisu was made with balanced layers of mascarpone cheese and sponge cake. The liqueur didn't overpower the flavours of coffee and chocolate dusting, making the dessert perfect for completing my dinner. Though A.venue Bistro looks slightly ostentatious, the menu is a list of dishes that are priced below $15. The restaurant promises a cozy affair with scrumptious Western food. 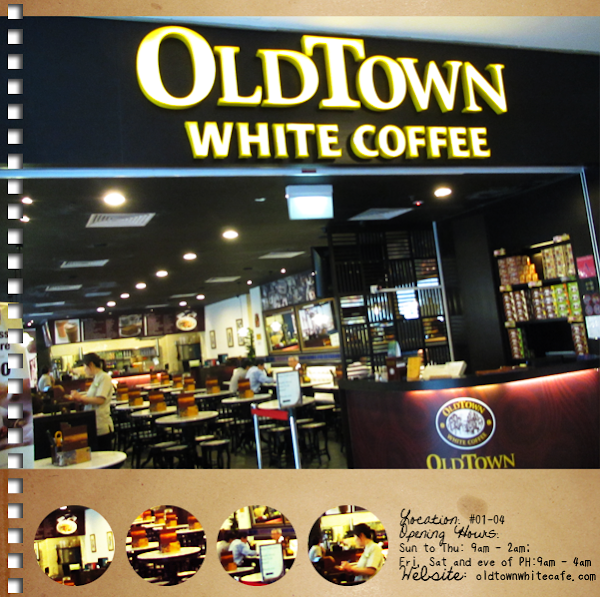 Old Town White Coffee hails from our neighbour, Malaysia, and it is the largest kopitiam restaurant chain there. Tucked away in a corner on level 1 of Cineleisure, its menu of classic dishes is a hit among the working crowd. When Fel and I were there, there were several tables of people in office wear, discussing animatedly about work (Or their bosses/ colleagues... Hmm...). You have no idea just how long we took to decide on our lunch! 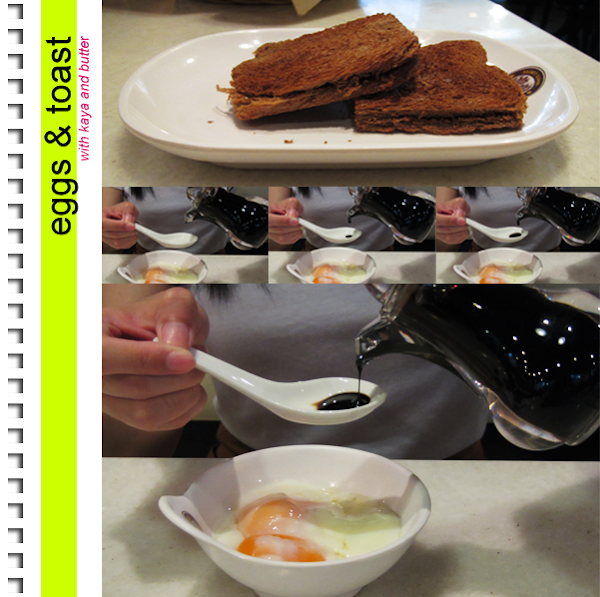 I had my eggs accompanied with Kaya & Butter Toast ($0.90). I need to have my half-boiled eggs with bread, otherwise the whole thing seems incomplete. But I realized that this isn't the norm. Haha. Fel was asking me how I ate them together. Well, what I did was to shred my bread into pieces, dip them into the delicious mess of soya sauce and eggs before wolfing them down. This way of eating makes A LOT of difference to the eggs (Or bread. Depending on which your 'main' dish is.). 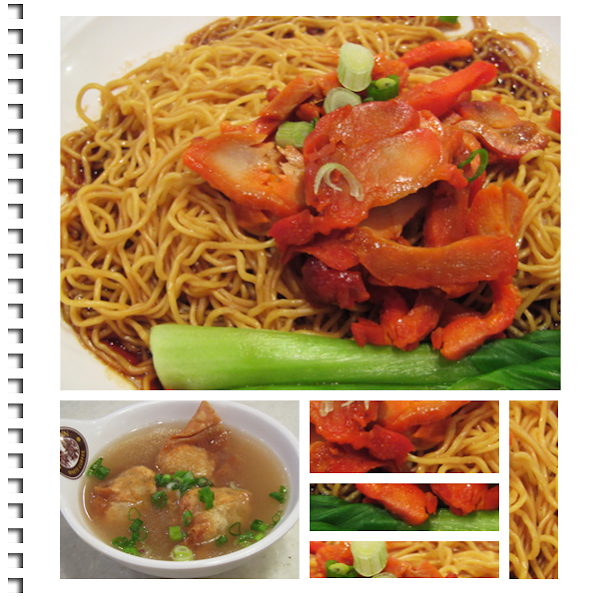 My lunch was the Old Town BBQ Chicken Egg Noodles ($6.20). It came with a bowl of dumpling in warm soup. Though it is a pretty simple dish, the noodles were neither too soft nor too hard... Pretty 'bouncy'. The chicken and dumplings were pleasant to eat, though they were nothing special. The place was pretty spacious and brightly lit. 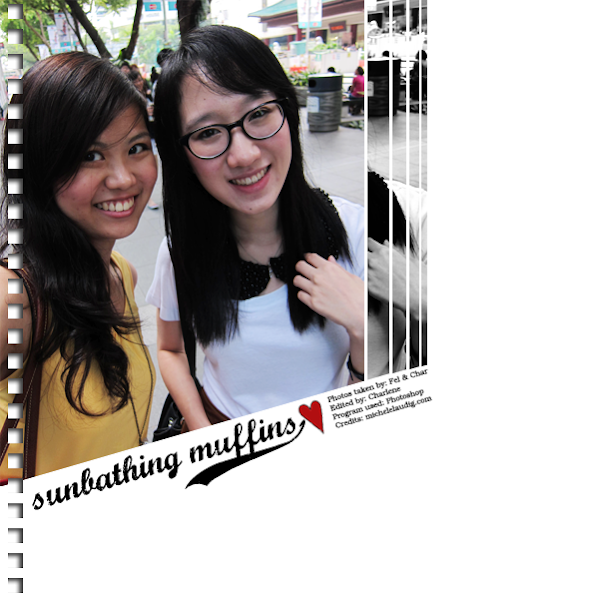 Fel and I spent a considerable amount of time there, reminiscing the past... Very apt for the place (Though I'm starting to feel old now. GLOOM!)! Old Town White Coffee offers a pretty wide selection of simple classic dishes. 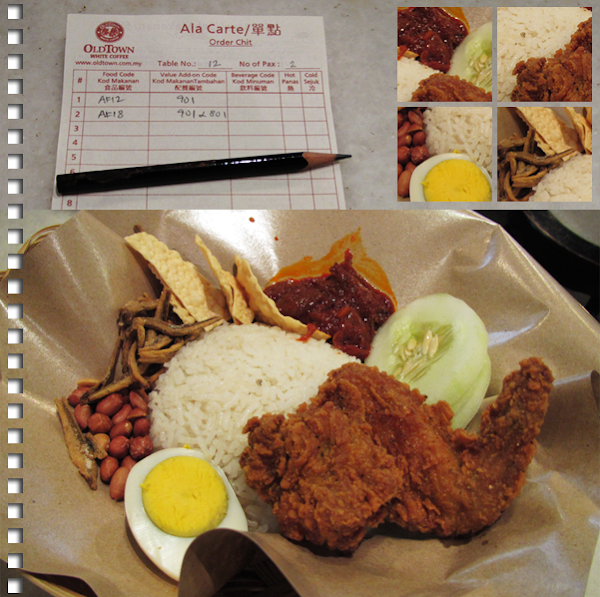 Prices are affordable and it's going to be my to-go place for Asian dishes from now on! 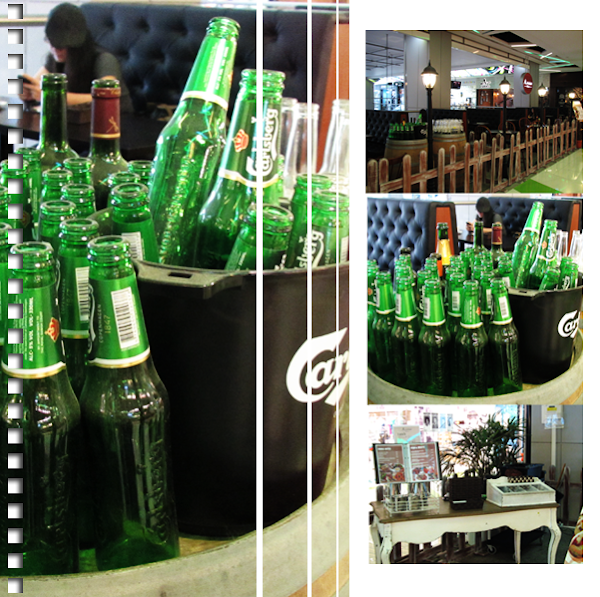 I have heard a lot about Artease, though this marked the first time that I drank their beverage. 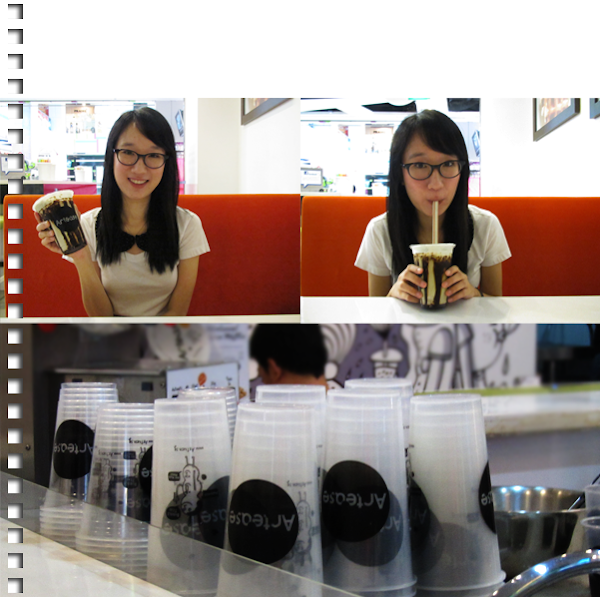 Shame on me, considering how I'm such a big bubble tea fan (TSK, Charlene!). The café has its wall covered in cute doodles and I would call it a 'cool hangout', except that makes me sound like a teenage-wannabe. Oh wells. A couple of tables, with bright orange seats, are provided for those who like to rest their legs for a while. On the left is Fel's Peach Osmanthus Tea with coconut jelly($3.70) and on the right, is my Chocolate Mint Milk Tea ($3.50). I had mine without bubbles that day. I usually drink almond or banana milk tea, so the Chocolate Mint Milk Tea was a nice change! Some of my friends say that mint tastes like toothpaste but I like how refreshing it is! The drink was a nice blend of mint and chocolate, with neither overpowering the other. I will certainly order this again! 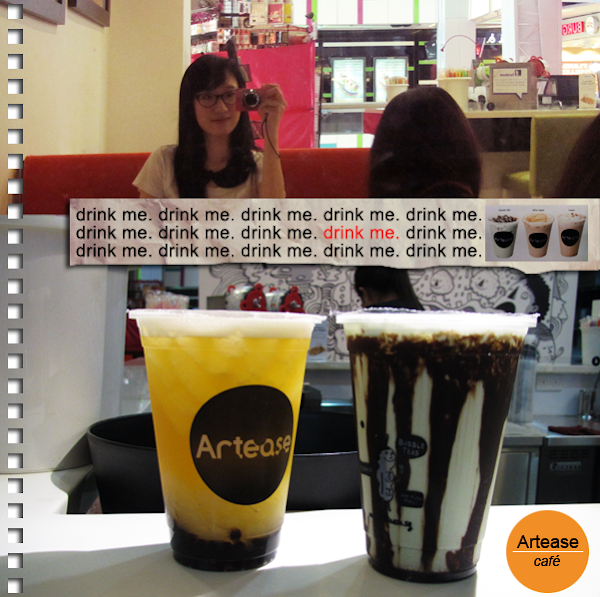 The Chocolate Mint Milk Tea is part of a trio of Artease's First Birthday Month Specials. The other two are Salted Caramel Milk Tea and Cinnamon Milk Tea. According to the bubble tea man, the Chocolate Milk Tea is the most popular out of the lot! Here's Fel, ever-smiling and picture-ready! 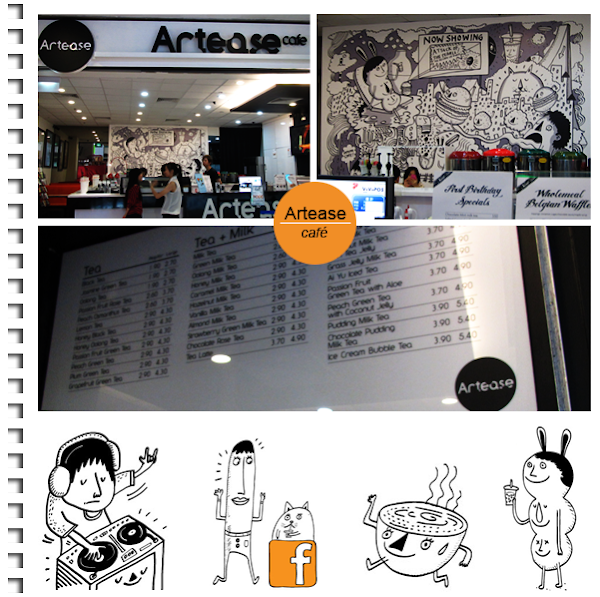 Artease is a nice stop for a drink and it separates itself from the many other bubble tea stores with its unique and creative flavours. Last but not least, Sticky! The place is a burst of bright, cheery colours and even the gloomiest of the gloomy will find a small smile on his/ her face. The candies are all laid out in a neat row, in front of the counter and the table where the candies are made. And ah! Finally, the end of a super duper long post! 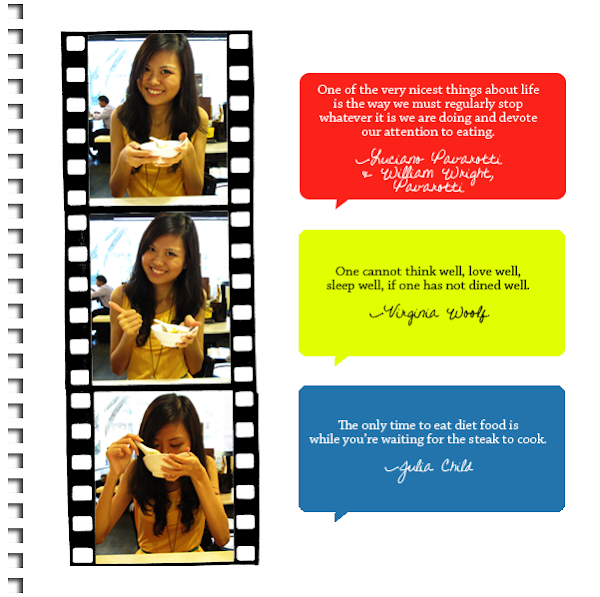 I hope this mini food guide has been useful to you. (: Thanks for reading!